Yellow Snapper (Pargo Amarillo) are a smaller Snapper found in the Eastern Pacific between Baja down to around Peru. 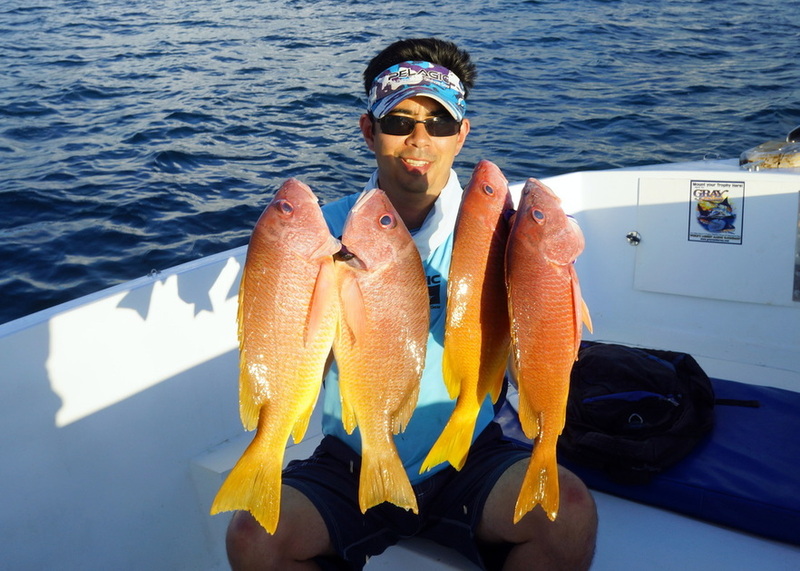 Like many Snappers, they are typically found near the bottom over rocky areas down to around 150 feet. They are an excellent fighter for their size but rarely exceed 7lbs or so. Their diet, as is typical of Snappers, consists of small fish, molusks, and crustaceans such as shrimp and crabs. The biggest ones are caught on large live baits fished on the bottom but metal jigs also account for some large ones. 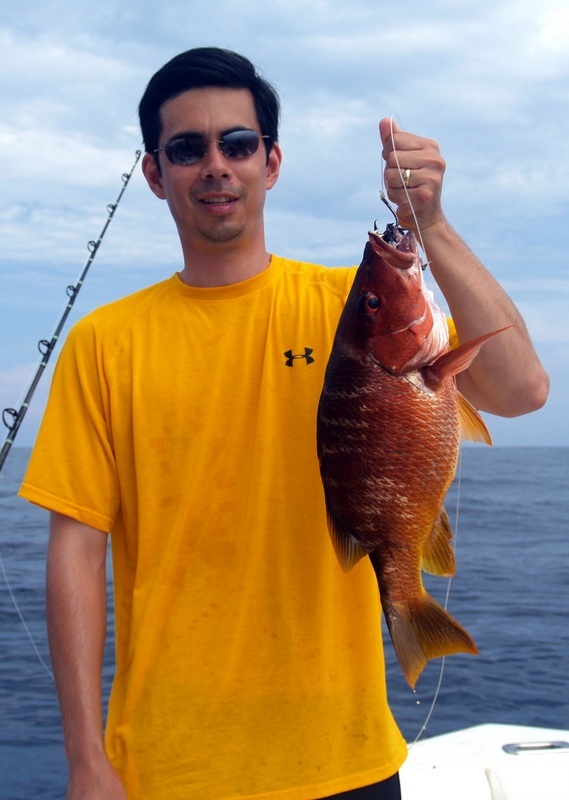 They are great eating but are usually more of a bycatch when fishing for larger fish. These things are extremely strong for their size and like to head for the rocks when hooked. I recommend braided line of around 20-30lbs with a fluorocarbon leader of at least 15lbs. Medium spinning or medium baitcasting tackle should work. Find rocky structure in 150ft or less of water and look on the fish finder to see if anyone is home. 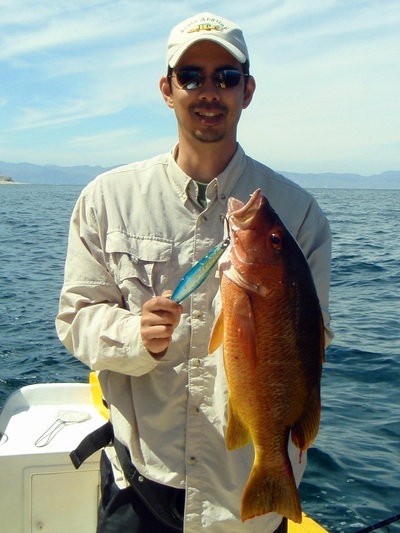 You can either troll over or stop to cast or drop bait or lures. Chum can help attract them. Metal iron jigs such as Salas 6x or butterfly-type flutter jigs are good choices fished near the bottom. Drop to the bottom, bounce them up and down a couple times, then reel up 20 or so feet and drop back down. Repeat while experimenting with the retrieve until you find what they are hitting. 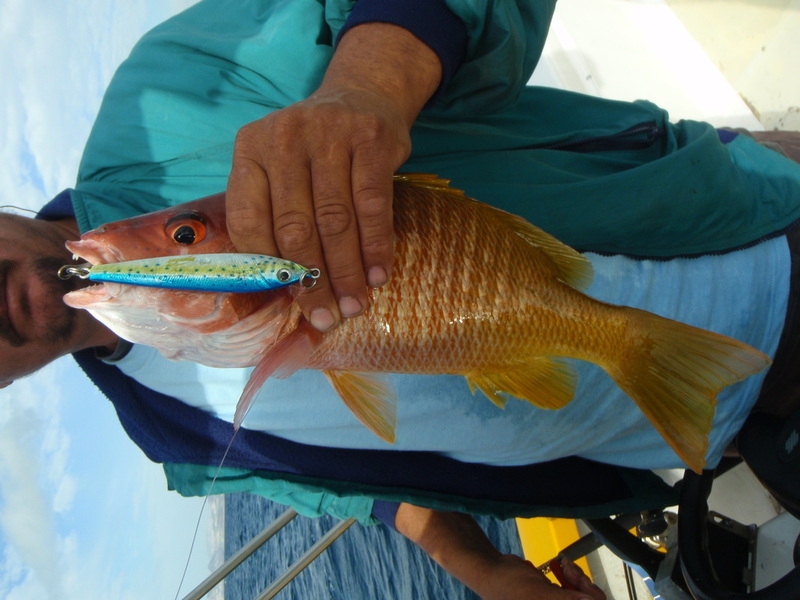 In shallow water they can be caught on surface iron lures such as the Salas or Tady or a Krocadile spoon. Live baits such as sardines work well. One good approach is to chop up some sardines and throw them over the side. When you do that, fly line a chunk of sardine with a hook hidden in it. 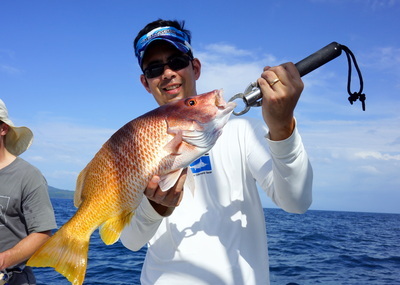 Let it drift down with the other chunks by manually pulling out the line from the end of the rod to give it a drag-free drift. If that does not work then they are just not eating. 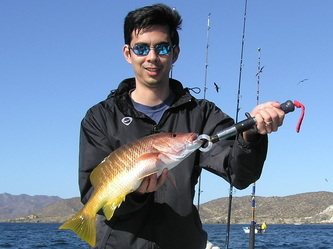 The Sea of Cortez has plenty of them, as does the Eastern Pacific between Mexico and Panama. 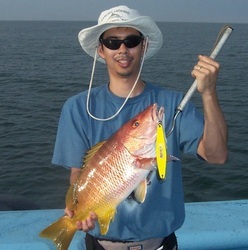 Not the best photo, but this is probably the largest Yellow Snapper I've seen. 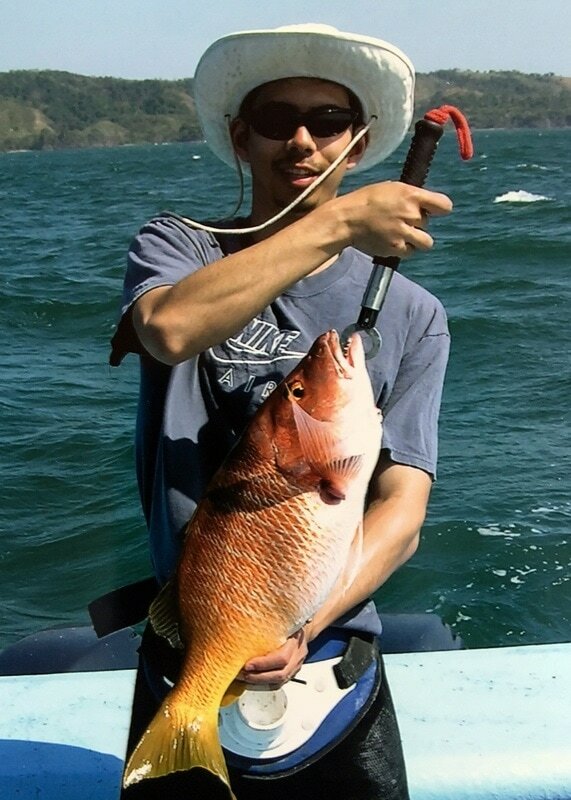 Caught in Panama.